InfiniteBody: Go backstage with the haunted "GHOST LIGHT"
Every exit is an entrance somewhere. Tumbling down Third Rail Projects' rabbit hole and through their looking glass in the Bessie-winning Then She Fell has long been my most cherished experience of this magical company. But now comes GHOST LIGHT, a worthy challenger, with the immersive dance/theater troupe smoothly roaming the innards of Lincoln Center's Claire Tow Theater, the hidden workings of a show and the psyches of some theater folk who remain unaware that they left their mortal bodies quite some time ago. Well, the show must go on! 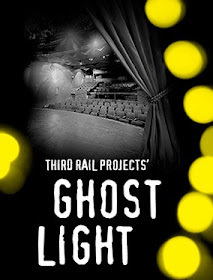 Yes, this work really puts the ghosts in "ghost light," that convention of leaving one light--a single bulb in a wire cage--burning on an unused, darkened stage. As we follow various players through stairwells and a warren of backstage spaces, we eye characters from multiple, imaginative viewpoints--gazing down at them from balcony or stair railings, glancing sideways from the wings at a rehearsal, tucked at the end of a corridor as actors and stagehands dramatically, distractedly and hectically dash in and out of doors with minutes to showtime. That last bit, by the way, is a brilliant farce of fluid, split-second coordination of people and props--a signature for co-directors/choreographers Zach Morris and Jennine Willett. Supported by an excellent collaborative cast and creative team, these two have outdone themselves. For fans who love the fascinating thingy-ness of TRP's productions--the busy, often quaint decor that colors and flavors their unusual sites--the wonderful set designer Brett J. Banakis has got you covered. But don't expect to have much time to linger and study these intricate visual details. Except for some props you might be handed from time to time, you will mostly be focused elsewhere or hustled past stuff. You will be distracted by noises and voices and music from unseen sources. Two intermission-less hours will fly by as fast as some of this theater's specters. One character--I think it was the wistful, elegantly-coiffed actress played by Jessy Smith--pondered the possibility that people who have died are truly gone only when no one's left who remembers them. Insight into characters is the least original or interesting aspect of this work; Morris's writing isn't nearly as dreamily graceful or as daring as his and Willett's movement ideas can be. But I did take note of this particular statement and its broader implications. How often do we encounter a work of art and wish we could make that experience stay with us forever? Keep it fresh, maybe share it--just as we received it--with others? (Why I write....) GHOST LIGHT, in its way, pays tribute to the art and artists passing through our lives, people whom we only think we know and whom we can't hold onto--except in memory. Yes, a wealth of technology can document these artists and the work they do. But, really, human-to-human, heart-to-heart, all of it filtered through your senses and sensibilities, embraced by memory, passed down to others--that is how culture has always been preserved and lovingly transmitted, even if imperfectly. GHOST LIGHT's stated end date is August 6. However, if this show is anything like previous TRP productions, it will have extended life by demand--and it should. Come out of the New York summer heat; the A/C's fine! For general information on GHOST LIGHT, click here. For important audience guidelines, click here. For tickets, click here. Don't be late!